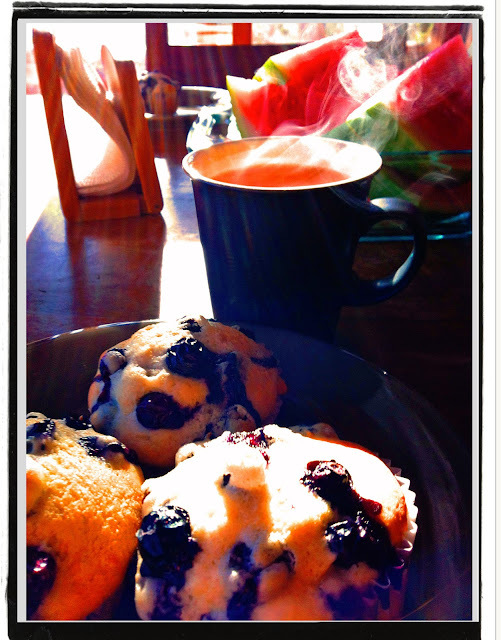 Muffins made with fresh blueberries, tea, and watermelon. No need for Hallmark to over-sentimentalize stuff -- I did it myself! Summer is all about food. Fresh ingredients, a bit more time to cook, and perhaps sharper hunger from doing activities. Blueberry muffins are part of the Portdaddia ethos. So much the better when the kids pick the fruit themselves. I particularly enjoy seeing the kids get a break from their Cap'n Crunch cereal that they usually mix with Mt. Dew or Red Bull. The kids totally get it that we go all wholesome just for the photo shoot, then all's back to normal.